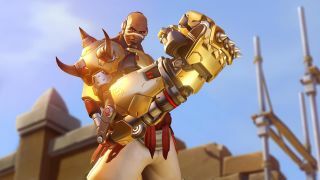 Blizzard has deployed a new patch to Overwatch, but this isn't your usual bug fixes and balance tweaks (although those are there too). Instead, the main thrust of this update is to make it easy for players to enjoy Overwatch League, the Blizzard-crafted esports gaming organization. There are two major additions new to all versions of the game. The first is the ability to watch Overwatch League matches directly from the game client. This means that when games are going on, instead of opening a separate app or firing up your PC / mobile device, you can just select the "Overwatch League" option from the main menu. It's a major boost to convenience, and will hopefully help people who are curious about esports get their foot in the door. The other new feature are Overwatch League skins. Just like any other major sport, each team in the League has its own, unique color scheme. A 'uniform,' of sorts, that can be applied to the game's heroes. And just like an NFL, NBA, or FIFA fan can buy and wear a jersey showing off their support for a particular team or player, so too can Overwatch players now buy League skins repping their favorite Overwatch League team. There is a bit of a catch, though. League skins can only be purchased with League Tokens, a new currency being introduced to the game. Each League skin costs 100 of these Tokens, a $5 value. You'll get 100 free Tokens if you log in to the game before February 13, but after that you should expect to pay a bit of cash to show your team spirit. If you wanted to buy every League skin (12 teams, 26 heroes), you'd be looking at... oh, about $1,200. Or you could buy 2600 Tokens (enough to dress every hero in your team's colors) for $100. Need a primer to get caught up on the League itself? Here's our in-depth look at how Overwatch League is pushing esports into the mainstream.